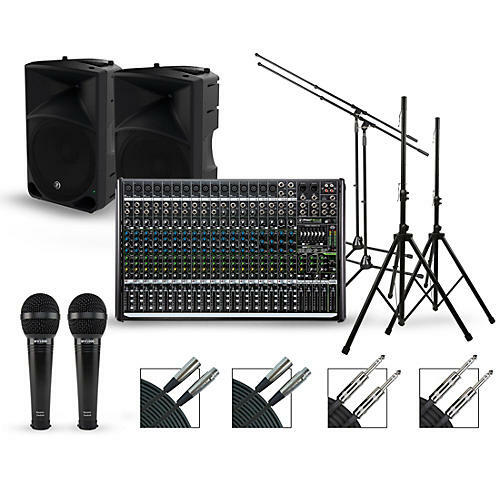 These premium Mackie PA packages make it easy to get started quickly with everything you need to hit the stage. We’ve done all the work for you and hand-selected the components for optimum performance. Each package delivers your choice of a pair of 12 in. or 15 in. Mackie Thump powered speakers, a Mackie ProFXv2 Series mixer, a pair of speaker stands and a pair of speaker cables. Rounding out the packages are dynamic handheld microphones, boom mic stands and mic cables. No matter your choice, each package is loaded with high-end technology and components for a powerful live performance. Designed from the ground up specifically for live sound, this series of small-format mixers features low-noise Vita preamps for unmatched sound quality and performance. Ranging in models up to 30 channels, the ProFXv2 Series supplies convenient features at every knob, fader, input and output. Its onboard ReadyFX effects engine employs floating-point DSP for rich effects, while the built-in audio toolkit delivers all the tools you need to control your mix and shape every detail of your sound. With 500 watts of continuous of power (1,000W peak), the Thump provides the high output you need in a tough, lightweight and portable enclosure. Designed by the world's leader in portable live sound, Thump offers a 3-band EQ perfect for acoustic and vocal-only applications. And with a rugged enclosure and robust system protection, you're more than ready for your next gig. Delivering real-world power levels, application flexibility and class-leading bass response, you can be confident that the Thump offers the best performance for your money.